Having recently built a scratchbuilt model of the British Challenger MBT, I began to start think in about a companion piece to go with it. I’ve said many times before that I prefer WW 2 tanks, but there are certain modern vehicles that have an appeal. 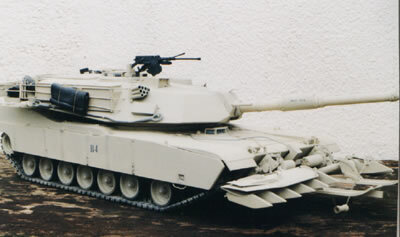 The American MI Abrams Main Battle Tank is one such tank, and with its slab-sided appearance is not that dissimilar to some WW2 German tanks. I guess the catalyst to my finally deciding to build the model was the discovery of some parts from a wrecked 1/16th scale Tamiya Leopard in my parts box. The first step when tackling a project such as this to see how many of the parts are going to he usable. Luckily the size of the wheels from the Leopard kit were the same as would be needed for the Abrams, a big help. but I still needed to change the appearance of the centres to reflect those on the Abrams. For this I used 20 thou plasticard discs and added 2mm hexagonal plastic rod for the new bolt heads. The centre holes were enlarged to 1/4 inch and into these I fitted short tubular stub axles in readiness for the swing arms. The next stage was to make a start on the lower hull and this was constructed from 60 thou plasicard, with most of the dimensions and shapes scaled up from the Tamiya 1/35th scale kit. The Squadron Signal Armour in Action title on the Abrams provided other useful details. Once the positions and holes for the swing arms and axles had been marked and drilled, the plates around the wheel stations were added from 30 thou plasticard and the bolts again came from hexagonal plastic rod. The return roller openings were drilled to 3/16th inch and tubes fitted, I also fitted the rollers themselves, which were taken from the Leopard and fitted to 1/8th inch tube axles. The axle arms were constructed from 3/8th x 40 thou strip back and front and 1/8 square strip middles both ends were fitted with 1/4 inch tube and reduced to accept a piece of thin steel rod for added strength. All the swing arms were then fitted to the Lower hull, taking care to line them up correctly. A full width length of tubing was now added for the rear sprockets and front idler wheels. The original Leopard sprockets were used, but as the Abrams has deeper centres than the leopard I first had to remove a 1/14 inch from the centres and cut off the front sprocket ring. I then added a piece of a car hub from the spares box and refitted the outer ring to achieve the correct offset. The hull sides and top was built up pretty well copying the l/35th scale kit using 40 and 60 thou plasticard. The rear griLle and exhaust outlets were fashioned from 1/8th 80 thou strip, all fixed to a piece of card to line everything up and then to the rear hull plate. Hinges were constructed from 3/16th x 60 thou strip and 1/16th diameter rod fitted up against the grilles and the roun rear light shrouds were cut from old marker pens. with the lights themselves made up from 60 thou card and all remaining details added using various sized rod and strip plastic. The upper sections of the hull were added using mainly 30 thou plasticard as it was easier to work with and then reinforced underneath with pieces of scrap. Thc opening for the turret was cut and a separate piece added around it to bring it up to the correct level. The top details were all added and some nylon mesh fitted for the top grilles, while the small hatches were built up from 20 thou plasticard using 1mm diameter rod and 100 x 20 thou strip for the hinges. 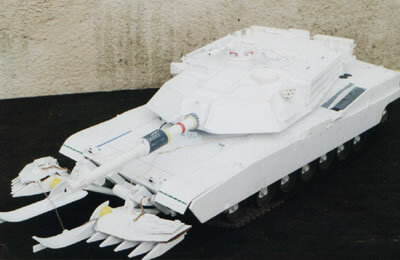 The turret was made by once again copying the 1/35th scale kit, stating with the base plate cut from 60 thou plasticard. This had to curve slightly at the back and front so I made a series of fine cuts in the back of the piece to make it curve more easily. In my opinion it wasn’t perfect, but with it being well hidden on the finished model I think its good enough. The two front side walls were made from 40 thou card cut to shape and then added to the base plate. Pieces of scrap plastic were used to fit it into place. The main side walls were then added to these after first putting a bevel on the joining edges and adding a piece of rod to the inside of the joint for added strength. The rear plate was now cut to shape and added to the assembly in readiness for the roof panels to be added. With the base and walls in position I started work on the roof. The roof is multi-faceted so I added each panel one by one, cutting and trimming the next one to shape until all were in place. It took a little trial and error, but in the end it looked fine. The turret top details were now added, starting with the two large blow out panels at the rear. These were cut from 40 thou and then 60 thou plasticard. with the bolt heads added later, The commander’s cupola was built up using 60 thou shaped card for the surround and 1/4 x 80 thou strip edged with 1mm x .5mm strip for the vision blocks. The hatch was made up as per the 1/35th scale kit so that it lifts in a double hinged action, with hinges shaped from pieces of 60 thou plasticard. The conduit that runs to the smoke dischargers are 1mm rod with brackets cut from sections of 1mm tube. The smoke discharger bodies were quite complex and made up from 3/16 round tube and 3/16 square tube fitted together with the back ends tapered and a piece of 20 thou ard glued on top. 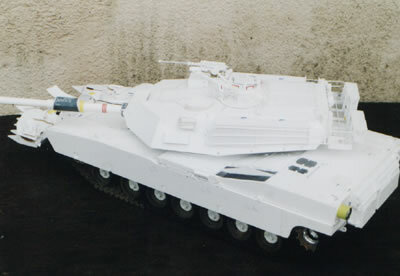 The resulting assembly was blended in using filler and brackets built up from 20 and 60 thou card to fix them to the turret, making sure that they mated to the conduit tubes. The large rear stowage basket for the back of the turret was made as a separate item constructed from shaped pieces of card. strip and rod. When the assembly was dry I added a piece of nylon garden netting, cutting and gluing it as I went. The wind speed indicator was made up from 1/4 and 3/16 tubing and fitted to the turret in the down position, as I didn’t want to snap it off! The turret was finished off by adding all the various handles and fittings, using various rod and strip for most of the parts. Thc gun barrel itself was made up using plastic tubing of various diameters and the body of a large marker pen for the fume extractor. Apart from some of the very fine details I thought the model was pretty well complete. but being a little crazy I then decided to go the whole way and add the mine plough is well. Having looked at the parts on the 1/35th scale kit I began to realise that it wasn’t as bad as i had first thought. First I made the main frame from 3/8 round tube, managing 10 get the parts close enough to make the left and right hand sections look equal and then carried on more or less as the smaller kit parts, using 30, 40 and 60 thou plasticard and plastic strip for most of the construction. The final job was to paint the model, not an insignificant thing on a model of this size. The desert sand colour was mixed up usin Humbrol Light Sand number 103 and Light Grey number 166 and applied by airbrush. The mix was varied a couple of times to different areas of the model to give some interest before finally weathering and completing the model. In the end was pretty satisfied with the result, even if it did take me around 400 hours and 3,000 parts to build!